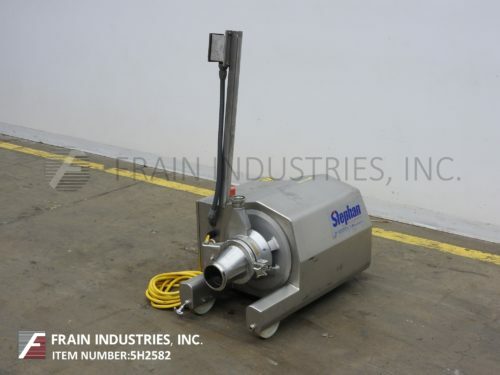 Stephan Machinery, Model MCH20, stainless steel Microcut emulsifying processor. Rated from 0 to 2645 lbs per hour – depending on materials, application and machine configuration. Equipped with 5"OD / 3¾"ID I-Line style charge port, feed auger into cutting set and a 2½" OD / 1¾" ID I-Line discharge. Knives and auger powered by a 20 hp drive with on / off switch. Vemag Model DP3, continuous, stainless steel, rotary vane pump stuffer and portioner, designed for smaller quantities and frequent different product change overs with easy cleaning and is rated up to 2,300 Kg per hour – depending on materials, application and conveying element. Standard weights from 25 to 200 grams or 410 to 140 portions per minute. Equipped with 24" ID x 24" deep tilt back divided product hopper with screw and side scrape capable, rotary vane product feed pump, vacuum pot, plug port and filter screen, knee level adjustment lever, vacuum pressure gauge, oil-less vacuum pump and 3" OD threaded discharge port with 40" floor clearance. Control panel has touchscreen controller portion and vacuum control dial and start / stop push buttons. Mounted on base frame with casters. 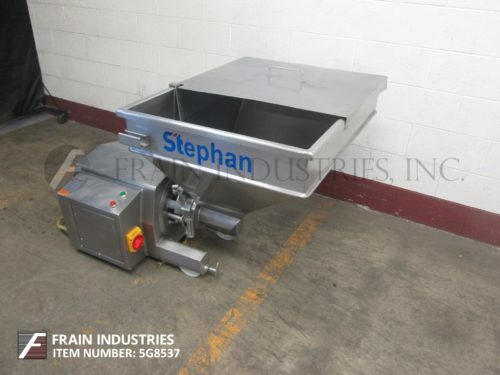 Stephan Machinery, Model MCH20, stainless steel Microcut emulsifying processor. Rated from 0 to 2645 lbs per hour – depending on materials, application and machine configuration. Equipped with 27" long x 35" wide x 19" deep product hopper, feed auger into cutting set and a rectangular flange discharge port with a 2½" OD / 2" ID Tri-clamp adapter. Knives and auger powered by a 20 hp drive with push button start / stop controls. Mounted on a stainless steel base with casters. Poly Clip Model DFC8161, automatic, double clip, chub filler, rated from 10 to 50 cycles per minute – depending on materials and application. Capable of uniform portioning from medium to large products up to 60mm in diameter. Equipped with a 400 clip capacity, double clip magazines (places two clips with each cycle) and utilizes 8700 series clips. 40" Long product roller conveyor, adjustable link sizer flap, iris separator and skin brake that automatically withdraws, prevents skins from being over stretched, capable of handling fibrous, collagen, and synthetic type casings, with A/B PLC. Stein, Heritage model, automatic stainless steel breading applicator. Capable of running flour and fine granular free flow coating materials. Equipped with a 36" wide x 36" long product in feed conveyor belt with 27" wide top applicator and bottom breading reservoir to cover belt and fully coat product, 30" wide x 35" long stainless steel wire product discharge belt with hooded blow off for excess breading removal. Coating material is transferred from filling station to top applicator by a 7½" diameter x 65" long stainless steel screw conveyor and further transferred to bottom station with a 3" diameter x 28" long stainless screw conveyor. Unused breading from conveyor belt is returned to the filling station by a 6½" diameter x 50" long stainless steel screw conveyor. Mounted on stainless steel base frame with casters. Number of product per hour – depending on materials, application and machine configuration. Vemag, Model 500, continous, double screw, vacuum stuffer and portioner. Rated from 500 to 2200 Kg’s per hour and protion weights of 15 to 10,000 grams – depending on materials, application and machine configuration. Filling pressure approximatly 20 Bar. Equipped with 38" OD x 32" deep stainless steel, tilt back product hopper with auger, side scaper and center baffle, double screw feed system (change part per application), side vacuum pot and plug port with filter screen, knee level adjustment lever, vacuum pressure gauge, oil-less vacuum pump and 3½" OD / 3" ID seated bevel discharge port with 43" floor clearence. Control panel has portion controls, speed control dials, vacuum control dial and start / stop push button controls. Mounted on (4) leg base frame with casters. Stein, Model APB Overflow, batter applicator. For use with conventional pumpable batters. Products per minute – dependant on materials and application. Equipped with a 34" wide x 92" long stainless steel wire belt powered by a 2 hp drive with variable speed control, 34" wide batter quad curtain to coat top and sides of product, lowered belt section to coat bottom of product, 5 hp batter pump and 2 hp blower for removal of excess batter. Includes on/off switches for pump and blower and push button start/stop control for conveyor. Mounted on a stainless steel base with casters.